The Oconee County Board of Commissioners will consider decommissioning its Land Application System sewage treatment facility on Rocky Branch Road and converting it into a park, Commission Chair John Daniell said at the first-ever State of the County presentation on Wednesday. The nearly 250-acre site also could accommodate a new fire station and a new facility for the Fleet Maintenance, Water Resources and Public Works departments, Daniell told the nearly 70 people assembled for the presentation. Daniell said he expects to come before the Commission with a plan for decommissioning the LAS site in the next several months, but he said the plans for the new park are long range–probably many years in the future. In the hour-long presentation Daniell ran through a series of recent activities and accomplishments of the county, including the upgrade to the Calls Creek wastewater treatment plant, the planting of trees on Mars Hill Road, and plans for a county fiber optic network. The Oconee County Chamber of Commerce was host for the presentation, which took place at the Oconee State Bank Operations Center, 7920 Macon Highway. 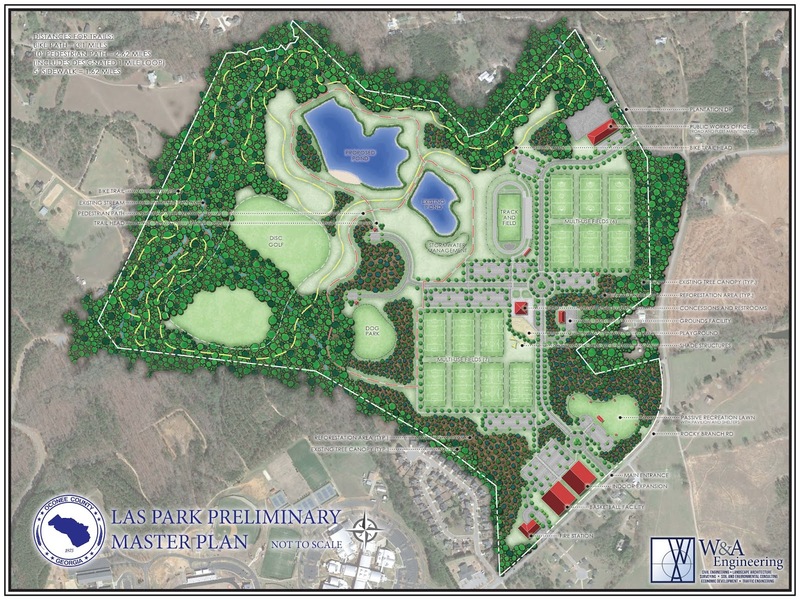 The LAS sits on 246 acres on Rocky Branch Road near North Oconee High School. According to county tax records, the county purchased the property in 2003 and began operating the sewage treatment facility shortly after that time. Sewage water is pumped through a series of lagoons and then sprayed on hayfields on the site. Daniells told the State of the County audience that the technology is now dated and difficult to operate. The county's expanded Calls Creek sewage treatment plant can handle the flow now going to the LAS. In addition, he said the location it not ideal as the county tries to eliminate pump stations on its sewer lines. “It is problematic having a sewage treatment plant at one of the higher points in the county,” he said. Daniell said W & A Engineering, 2470 Daniells Bridge Road, had prepared the chart, which shows 13 multi-use fields, a track and field, a dog park, an indoor basketball facility, a disc golf course, a bike trail and a pedestrian path. The design also incorporates an existing pond and envisions the addition of another. The LAS is on a tributary to Barber Creek, and that tributary and the existing woods around it are incorporated into the design Daniell presented. “This has not been vetted any more than just a few of us sitting around the table saying what could we do,” Daniell said. “We’ve got a long ways to go. The LAS site would add significantly to the county’s park land. Oconee Veterans Park on Hog Mountain road is 198 acres, while Herman C. Michael across from Oconee Veterans Park is 38 acres. Heritage Park in the far south of the county of U.S. 441 is 364 acres, and the Bogart Sports complex is 33 acres. Daniell’s comments on the possible decommissioning of the LAS site were near the end of his one-hour presentation. Those same goals are articulated in the Oconee County Annual Report for 2018, which was released at the State of the County meeting and also is available on the county web site. Before turning to those four goals, Daniell and the Annual Report review financial data for the county. 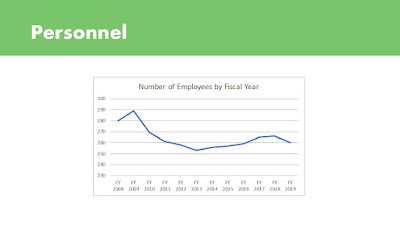 Those data show that 51 percent of the county’s revenue is from property tax, and Daniell said later in the presentation that his goal is to get that figure to below 50 percent by bringing new businesses to the county. “Engagement and transparency are kind of our key words,” Daniell said as he began discussing Smart Government. 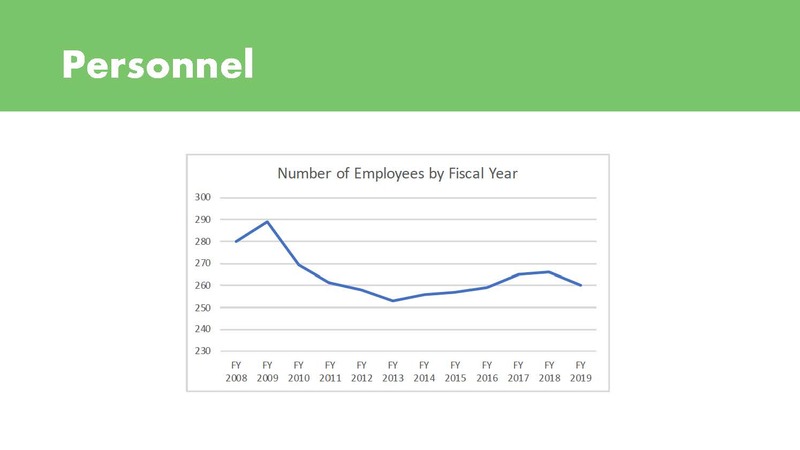 “People are our greatest asset,” Daniell said, noting that the county now has 260 full-time employees, down from 289 in 2009. Daniell referenced the county’s decision to move forward with plans for a high speed fiber optic Internet network in the county as an example of smart government. Daniell began his comments on Smart Growth by referencing the Comprehensive Plan the county adopted in 2018. “We want to make sure we get quality development in the county,” Daniell said. 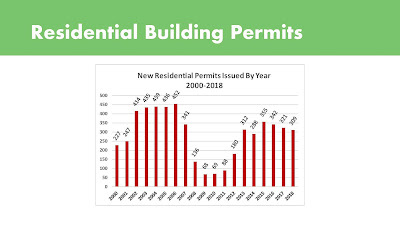 Daniell presented a chart showing that the county had issued 309 new residential building permits in 2018, down from 462 in 2006. “We’re trying to be aware of how fast the county can grow,” he said. 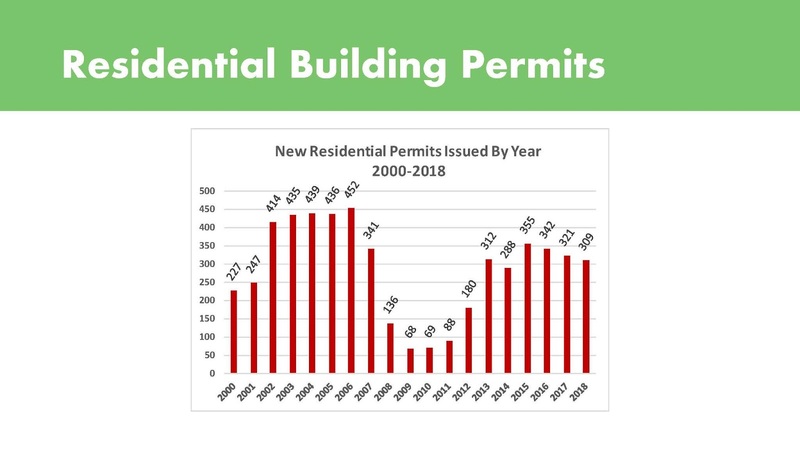 Daniell said 300 permits per year is a good rate of growth. Daniell cited the county’s investment in its Calls Creek Water Reclamation Facility as an example of investment in smart infrastructure. He announced that the county had received its permit to increase that plant’s capacity to 1.5 million gallons per day from 1 million gallons per day. Daniell also discussed the improvements to the Courthouse, the construction of Fire Station No. 8 on Virgil Langford Road, and the beautification of Mars Hill Road. Daniell also discussed the extension of Bishop Farms Parkway and improvements to Malcom Bridge Road, starting with the intersection of Malcom Bridge Road and Mars Hill Road. Daniell said he was a skeptic about roundabouts but has been convinced of their worth and that the county will build as many as four on Malcom Bridge Road between Mars Hill Road and Lenru Road. The decommissioning of the LAS site was the final example Daniell gave of Smart Infrastructure. Daniell said Quality of Life “is really why almost everybody is here” in Oconee County. He cited the expansion of multi-use field at Oconee Veterans Park as an example of the county’s investment in Quality of Life. He also mentioned the county’s investment in a grant application to expand the Senior Center in Oconee Veterans Park as another investment in Qualify of Life. Other examples are the newly renovated Bogart Library, Daniell said. 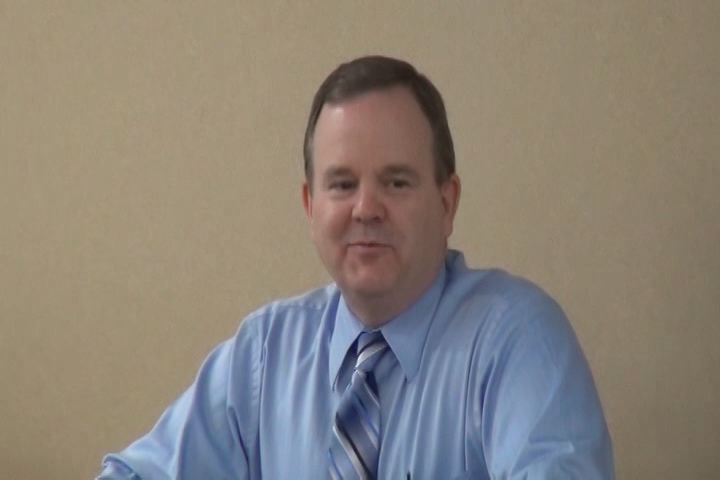 The video below is of the entire State of the County session on March 27. Courtney Bernardi, president of the Oconee County Chamber of Commerce, introduced Daniell. Also in attendance were commissioners Chuck Horton, Mark Saxon and Mark Thomas. Daniell began his comments on Smart Government at 8:28 in the video. He began his comments on Smart Growth at 15:40. He made his comments on Smart Infrastructure starting at 28:35. Specific comments on the LAS site and a possible future park are at 48:44 in the video. Daniell’s comments on Quality of Life begin at 51:08. Marshall Hooks, vice president of Operations for the Chamber, closed the session with announcements of upcoming events. The county will need more parks as the population grows and this area is in a growth area so sounds like a good idea as a recreational park. Remember it is a LAS. - part of our sewer system The taxpayers of Oconee County have paid for this facility for years. The BOC has not applied the tax dollars with any concern for upkeep or planning of our infrastructure. John Daniell puts out another “promise” project- a park. We only have to pay for it. 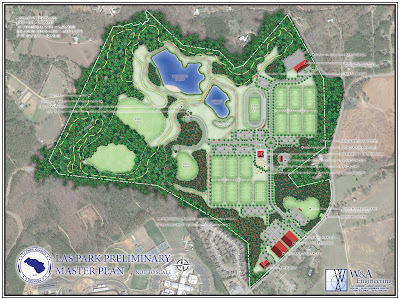 Remember a few years back as a commissioner he was opposed to expanding tennis courts at OVP and the Watkinsville library. Now, not that far away from his re-election he has promised a library and a park. It took 5 years of SPLOST dollars to get 2 ball fields. Daniell has checked off a part of our sewer system and added new land for a 30-40 million dollar sewer project. Hello more land development. Yes, we have so much to be happy about. The announcement of all our “gifts” comes during a very small, limited space event brought to you by the BOC and the Chamber of Commerce. The entity we turned over our county economic development with no feedback from the citizens of Oconee. If Dr. Becker did not report, the rest of the county would not be aware of anything. Danielll says in regard to park- “this has not not been vetted ...just a few of US sitting around the table saying what we could do.” Glad you let the citizens of Oconee in on your decision with a few folks around the table. Daniell says Smart Grow with NO specifics. I guess the Boswell metal building on GA 316 was part of smart growth. Welcome to Oconee -the home of irresponsible planning, just look at what we have to greet you on 316. Sorry to go on, but years of wasted tax dollars and the double talk by a politician for 4 more years with a $100,000 year pay check is not a future for Oconee County. I was around for the 2015 SPLOST discussions, and Daniell was not opposed to either project. If fact Daniell pushed to make sure the recommendations of the Recreation Committee and John Gentry were followed. Although, Daniell asked questions about plans for a new library, there was not objection raised to the project. I don't think you watched the same video posted here. Based on the recording, no decisions are made. I believe Daniell talked about the ideas coming before the BOC. Wow, not sure what Daniell did to you but it must be a pet project that got rejected. Also, remember there are 4 other people vetting this stuff as well. A longer memory is needed in this case. 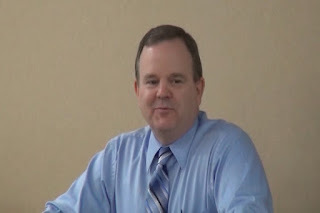 Daniell opposed said projects prior to 2015 as he sat on the board as a commissioner and stalled any meaningful things to happen while on the BOC. Sadly, you answered your own point in regard to other board members. I occasionally attended meetings (or read newspapers articles) where Daniell halted needed programs such as: to do away with the Keep Oconee County Beautiful Committee funding, cut back on county government pay increases, denied part-time employees for the library, code enforcement, health department and the Ag county extension staff, kicked the adult education program out of a single small space (they found a home at the Christian Church) and refused to see the problems with our streams, creeks and rivers to name a few thoughtless acts. Look at his whole record with slicing up of past budgets at the loss of good people and meaningful programs. The people of Oconee County will pay through increased fees and new or increased taxes for a park, library and sewer. A new sewer treatment plant to assist those out of town developers.They will not pay for it- we will. Sorry, no pet project, I just live here. And growing increasingly tried of over paid politicians at taxpayers expense. Just my “observation” of Oconee.